bits-en-pieces: Thank You Globe for the 917 Bonus Reward Points! Surprises really come in a most unexpected ways possible! 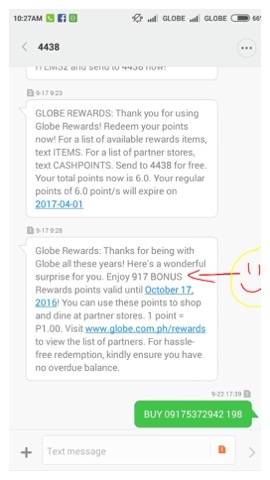 Last September 17 (9/17/16) I received a text from 4438 of Globe Rewards informing me that I have been given a 917 BONUS Rewards that is equivalent to Php917! For being with the telecom as a postpaid subscriber for almost 10 years, and for having that 917 prefix in my mobile number. I didn't expect it that's why at first I thought that there was a technical error with the rewards system. But through the text I got it confirmed. Also, they have this 917 craze celebration since started several years now as far as I can remember. So the bonus points added up to my current points I've earned over time. The bonus can be used up until October 17 of this year only and my previous points can be used up to March next year. 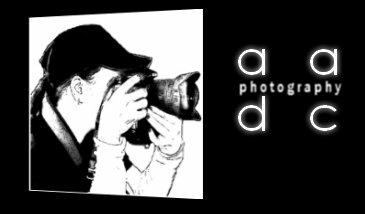 That's why yesterday after office I decided to go to the mall with my daughter M and do some errands and try to use up some of that bonus points and see how it goes. This is not my first transaction using Globe Rewards, I am quite familiar with it since I have used it several times before. But, last night was a bit off and a lot of time wasted. I convinced my daughter for us to get dinner at KFC since I don't want to wait for food if we get one from Max's which offers Globe rewards for payment too. But, when I was at the cashier counter and made the transaction texting the assigned number for that KFC store after placing the order. Guess how long we waited for the confirmation text... 10 minutes! Before the cashier can process the food order they need to receive the confirmation text that the total amount of purchase was transferred. We were a bit starving that time and I was thinking what the heck! I can pay that amount in cash and not subject ourselves of waiting until who knows when. Yeah, I was so impatient...but I don't find any positive thing about it. 10 minutes was kind of long to wait, I can do so much with that time. Anyway, the food was served after another five minutes of them preparing. That is why I forgot to take a photo of our order for me to use here. I and my daughter ordered the same P99 Fill-up box of one chicken, rice, soda and a mushroom soup, though I got my chicken spicy. 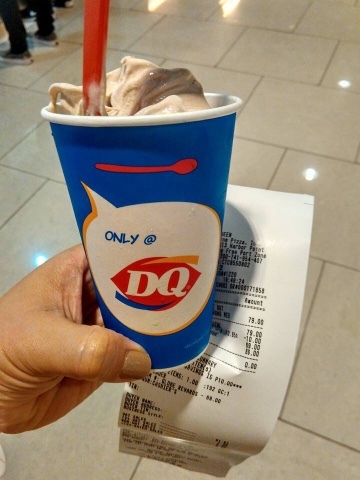 Next stop was Dairy Queen, they also accept Globe points for payment with a minimum of 50 points= Php50. We were supposed to get the DQ BOGO craze which I saw on Facebook too. But the store in Harbor Point informed the customers including us that it will resume on October 10..bummer! As not to disappoint my daughter because she was excited about the DQ treat, we purchased one instead. They have this free upsize for students who can present their school ID. We fall in line and texted the code and stuff to purchase an ice cream. In my thoughts, this transaction will not last that long like what happened in KFC... but I was wrong. It lasted more than the waiting time we had at KFC. While waiting, we left the store to roam around the cinema thrice, sat and checked the store again. After a total of 15 minutes, we received a text. My daughter showed the cashier store the text and she got her ice cream with the free upsize. Okay, guys don't get me wrong... some of you might think that I complain so much though I was given a reward and all for free. Yeah, I am very much thankful for that, but if you are there in the situation itself and you will wait for who knows how long... you will feel the same as what we felt last night. 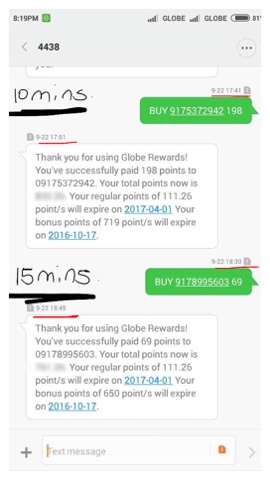 Comparing to the before transactions using Globe rewards, confirmation text can be received within a minute or so, no time for that waiting game. 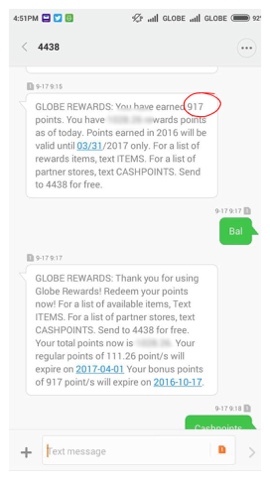 I don't know what is going on with Globe rewards, but now I know what to do next time since I still have a lot of bonus points to use before it expires. My thanks to Globe Rewards for the bonus points! 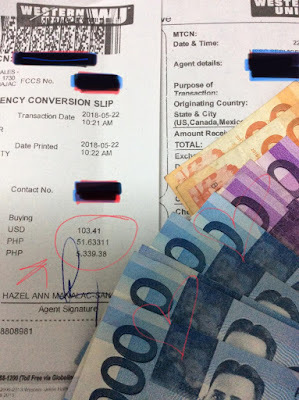 Are you using Globe points too in purchasing items and food? 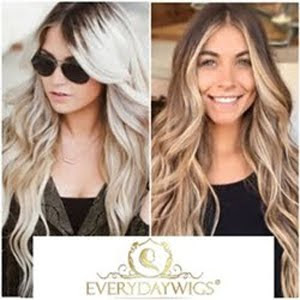 How was it going on your part?